Scientific Advertising - Claude C. Hopkins. Audiobook. 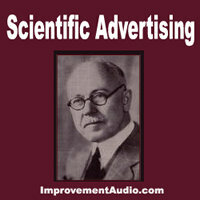 Download Scientific Advertising MP3 audio book. Length : 2 hours approx. Chapter 4 Mail order advertising-what it teaches. Chapter 8 Telling your full story. Chapter 9 Art in advertising. Chapter 10 Things too costly. Chapter 13 Use of samples. Chapter 16 Leaning on dealers. Chapter 20 A name that helps.